Examples of Full Awake ACTIVE supervision! 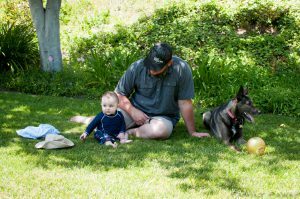 Every dog and parent professional says Supervise dogs and kids, especially babies. What does that really mean? Here are some examples of Full active supervision. To see more of what Family Paws means by supervision check out our handout here. Body blocking is an easy way to include your dog while engaging with baby. Using your body in between sets a boundary. Adult interacts with the dog and is in between while the toddler jumps around in fun. Adult sits in between baby playing and the resting, relaxed dog. Dog & Baby on the scene….a parent in between! 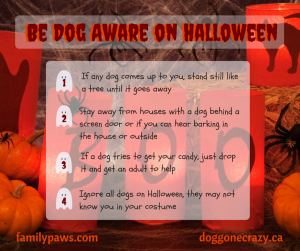 Don’t Scare Be Dog Aware! 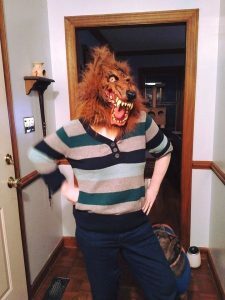 Halloween is a fun time for those who choose to participate.. Not all kids enjoy this spooky night nor do dogs. Be respectful and considerate. Here are some great tips! Join us October 24, 2018 at 7pm-8:30pm Eastern time. The perfect webinar for all dog loving families expecting a baby! 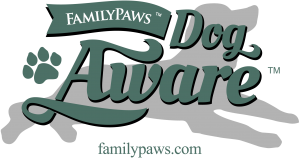 We invite ALL family members and professionals who support families with dogs. Dogs do not love ALL kids… Really? Oliver may enjoy older children but toddlers can make him uncomfortable. (like in photo left) might not feel comfortable with unsteady toddlers. The unpredictability of toddlers may make dogs uneasy. The frequency of child visits and exposure to a dog also impacts how strong the bond is in that particular child and dog relationship. Dogs do not generalize kids as a group but rather dogs measure each encounter with each individual child. Our job as adults, is to make a child-dog encounter a positive one and begin each encounter as if new every time. We also must consider the comfort level of each individual child. 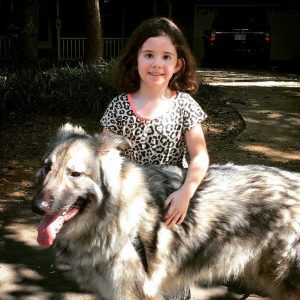 Is the child comfortable with dogs? If not, then an introduction creates stress right away. Does the child have dogs at home? That can cause a reaction from a dog when the child visits. The dog may be very curious about all the scents the child brings with them. Dogs love sniffing people all over when they smell like other interesting dogs. Children have the right to say, “No” to meeting, touching or engaging with a dog. 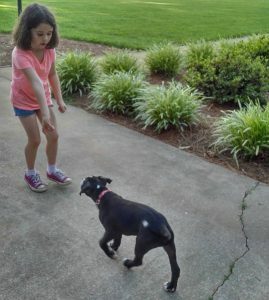 When a child does not want to meet a dog, then dog management at a distance is a priority. This is an opportunity for the dog to stay at a success station such as outside space, another room, behind a barrier. This is the perfect opportunity to allow your dog a yummy frozen goodie to enjoy while in their success station away from the kids. Dogs also have the right to say, “No” to a child visit. Dogs do this through their body language. Turning away, Whale eye, licking lips and many other subtle signals may indicate they are not interested in interaction. When a dog shows stress signs as a child visits, the dog needs a way out such as a path to retreat. Praising the dog for choosing to leave will reinforce a safe retreat when needed. Dogs and children have different comfort levels with each new person and animal they encounter. We must listen and respect what they communicate with us. Kiss to Dismiss- Not all licks are the same. 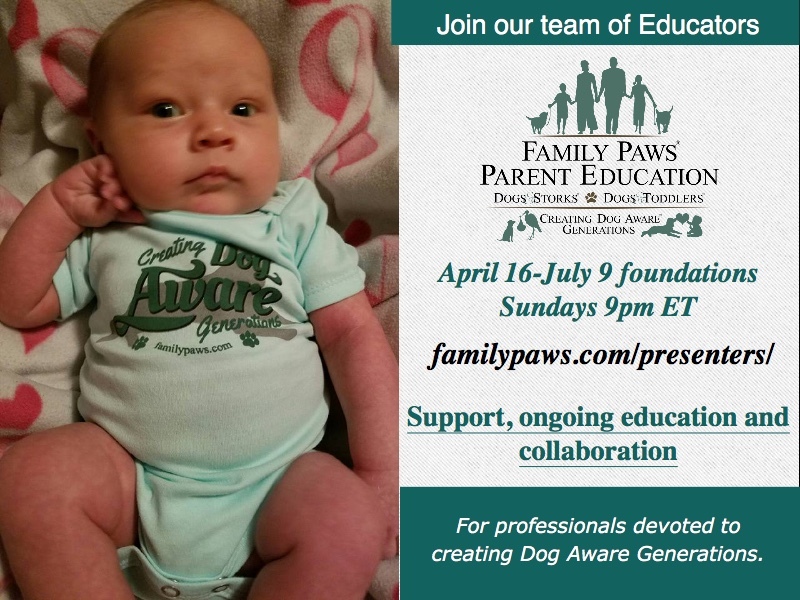 Ready to join the Family Paws Team of professionals? Family Paws Parent Educator Course is indented to help professionals who choose to use our licensed materials in consultations or to offer community education. 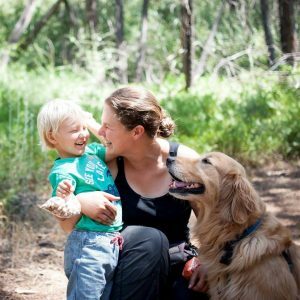 Our 13 week course is just the beginning of the support and learning we do together as a strong network of professionals dedicated to dog and baby/toddler dynamics. 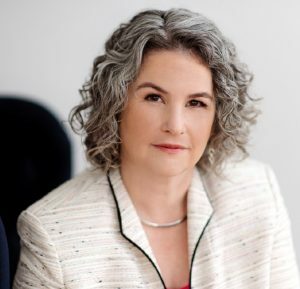 Our course for professionals runs 4 times a year. Once approved into our program you may jump in at anytime! Here is more information about cost, time and CE’s for our program. We are always looking for those who truly have a special interest in helping to create Dog Aware Generations beginning BEFORE baby arrives. Are you that person? Learn more here! Join our strong team of dedicated professionals all over the world who are making a difference in the lives of dogs and their families one stage at a time. We really encourage our families to increase their Dog Aware skills by becoming in tune with their dog’s subtle responses. Ever notice a change in your dog’s behavior when someone approaches with a hat on? Sunglasses? Costumes? What about kids running around in snow suits? 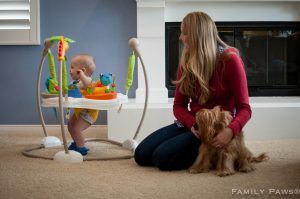 If you are expecting a baby to be visiting or living in your home then you want to keep in mind that subtle changes can decrease comfort or startle a dog. This image is of me with a mask on. I got the ask to scare our teenage daughter and to just have fun. Unfortunately Oliver was let in from outside while I sat on the steps waiting to SCARE my daughter. Well….Oliver was not impressed. He was spooked and acted as such. As soon as I took it off he did some recovery head shakes to let that awkward moment go but he definitely was not pleased by this mask. He, of course, reacted to this sudden odd change in appearance. Here is another example. 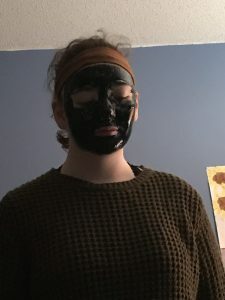 My daughter walked in the room with this facial mask and I about jumped out of my skin. This contrasting look and change in appearance started me at first. 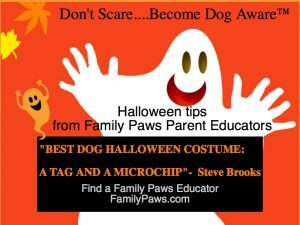 We have to remember that just like people, some dogs are spooked or startled easily while others are not. Know your dog. Be Dog Aware and observant about their responses and what they mean. Dogs that are spooked can bite. This is not something to make light of or tease a dog with. It is something to be aware of so that you can respond accordingly or adapt a situation if you notice your dog is stressed, unsure or reactive in some way. It took us a minute to realize this was making Oliver uncomfortable too. He was coming up close and acting very uneasy with her. Then we both quickly realized it was the visual change he noticed and we were able to help him relax and take it in at his own pace with our support. In this situation it took kayleigh talking to him and her turning away from him when he came close. This allowed him time to really “know” it was her and settle down. Can you think of examples that might involve young children? Please share! Our dogs observe us all day long and when it is just we adults….they are quite used to our patterns of motion etc. Once a baby arrives there are all sorts of odd looking actions that can cause dogs to become confused, excited or reactive in some way. 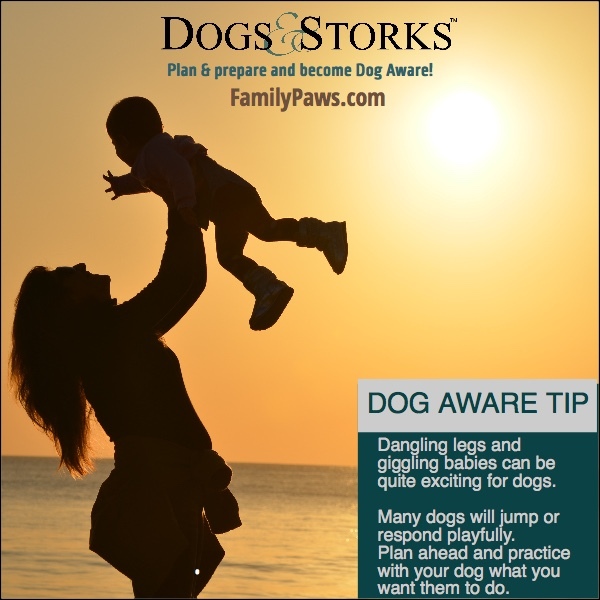 FPPE encourages families to know their dog and learn what triggers they may have. Ex: if you lift up a toy from the floor does your dog jump wildly? If so then working on a new behavior you want your dog to do when you lift u a toy may be a great idea. Our educators love problem solving with families before baby arrives. Don’t wait until your dog jumps and you feel anxious about their response. Being Dog Aware means preparing and continue learning with your dog before and after baby arrives. This is new to both of you! Set you and your dog up for success by thinking through some of these possible opportunities. 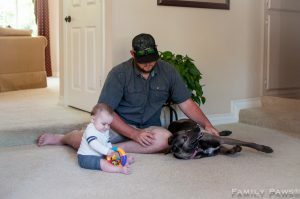 Here is a great example of a Dog Aware parent making a good choice when lifting baby. Tossing the dog’s toy away so that the dog is occupied while she lifts baby. Nicely done! Do you have examples to share with us?